One Essex winter (or was it ten? ), John Alec Baker carefully, methodically, calmly, found and followed the peregrine falcons that made the Chelmsford countryside their home for six months of the year. 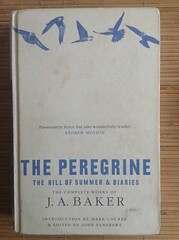 (Sort-of)Author’s page: J A Baker & The Peregrine – a website about the author, his writing and his Essex environment.